Almost all came today. 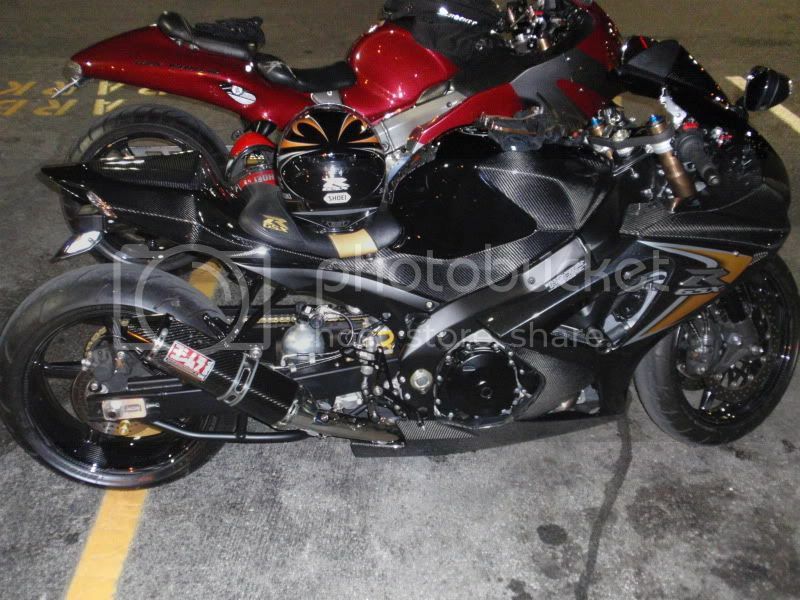 Will go on a Gen 2 Busa 2009. Good Lord! Frame by frame build up, please, Paul! Someone's got to make Murderedout's build thread look small. 2 budys of mine bought a Kit for the older Busa and also want to certify it so we can drive it street legal here in Germany too. Also a Problem is making a Boostcontoller for a supercharger. This week a exhaust company is making a certifyed 4 in 1 for me. Also I will fit in the OEM Header pipes ( in both I have to bend the 4 zyl. Pipe near the 3rd because the charger goes in at that place. I will see them what exhaust makes the lowest noise. Plenum will be normal - for now. I must check the intake air temp. if I need a intercooler ........... for low boost I do not think so. The kit itself is good quality ........... good welding work too. Yeah it's getting up there isn't it? I know you and the other guys are motivated overall. thats billet machined perfection right there. I see you have a decent mounting bracket for the blower. Looks like a Rotrex C30? and belt drive ? Watch out for access to the oil filter. We got mine working damned well at a shade under 240 rwhp (Rotrex C15) and almost street legal. Had to cut and shut the Yoshi headers around the blower and intake pipe too. nice Pics. I also have to remove the 4th Header Pipe. The bike is right now by a special Exhaust Company who is making me a street legal 4 in 1. I have a bigger Oil Cooler. i must see where I can put the Airfilter, do not like it on the side that it shows out. I have a C30- 94 Charger .. for the street legal aproved Test I want only 0,45 Bar 7 PSI. In the newer Kit the oil reservoir is a little box that goes under the seat from the passenger. Yeah the airfilter is too exposed to wet and muck off the road where it is. You may find a billet shallower sump helps with the exhaust header alingment. I had difficulty changing the oil filter on mine due to tight access. How about the cooling fan ? Are you going to upgrade it? My bike had no overheating problems during summer, but we have had 3 very mild summers. Hey Paul , You have a very nice Project. It's a new item in Germany and Holland. D.W Michel with his Bronze/Silver '99 SG is a friend off mine. And Max and Bernd, tipt me about this Topic. I am follow your K8 SG Project . Hi Paul , thanx or the PIC. Did ? you the fine tuning on D.W his '99 SG Busa.
? , is the Back Bracket , the small type from TTS. D.W has the Proto type , from TTS. Groeten van Kees uit Holland . The Kits right now look alot better. Its the blower intake pipe that sits tight infront of the oil filter that gives access problems too. unless you are ok with removing the headers every oil filter change. Got the Bike back from my Exhaust expert .......... WOW -- 4 in 1 Street legal, made 210,3 HP, 166,5 Nm !!! First Dyno was stock exhaust 187,9 HP 151 Nm. That is over 22 HP from stock - no ECU Hacking, stock Airfilter. Well, with this Exhaust company I had the best HP gain ever, the old Busa came over 15 HP. Hey Paul , you post. (Got the Bike back from my Exhaust expert .......... WOW -- 4 in 1 Street legal, made 210,3 HP, 166,5 Nm !!! First Dyno was stock exhaust 187,9 HP 151 Nm. TOP results ! ! ! Please sent , the name off that Exhaust expert to me. P.M i hope you now or E-Mail. You post 15 HP + on the 1e Gen, STD i think is 175 HP. Can you send more info , off that OLD machiennnnnnn. Greetings en Groeten van Kees. If you or other ones need something - I will help out. I should stop here and test with ecu Hacking or Power com. how much I can push out of the GEN 2 with the exhaust ....... well, the SC projekt must go on first .. and the 210 HP are on the crank !!! Hey paul , thanx for the quick response. Nice results , off a TUV 4into 1 exhaust. After testing + testing --- the in air was kind of too high for me - for safe feeling I`m putting a intercooler in ..
As you see the charger goes out of the fairing about onjly 4,5 to 5 cm. The clearance is good for roadracing. A Pic from the front. Almost like a sleeper, great job ! I love the exhaust, it looks a really quality system.